A tool that allows people to sync their files across multiple computers by merely dragging and dropping files on the desktop has arrived in beta – and there is already talk that Dropbox could be a major hit. With increasing numbers of people moving data between mobile phones, laptops and desktop machines in their work and homes, the need to have synchronized files has become increasingly pressing. Although online storage systems – such as Microsoft’s SkyDrive – allow users to have a central online location in ‘the cloud’ (aka in online storage), an automatic synching system could become the must-have program of the year. As the introductory video shows, users can save files in a way that means that the changes are available over their whole range of computers. And the version tracking even allows the recovery of accidentally deleted files or old incarnations of changed files. 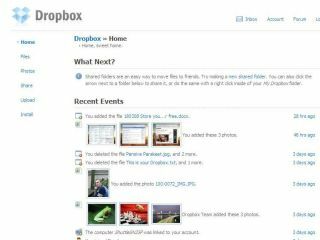 Dropbox also allows public file sharing – the bane of copyright holders, but an increasingly prevalent part of the internet. Dropbox is the idea of three MIT graduates, Aston Motes, Arash Ferdowsi and Drew Houston, who set up the project with seed funding from Y Combinator.